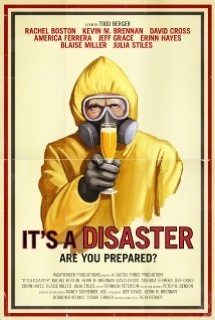 Review: “It’s a Disaster” is a comedy that ridicules loving relationships, the end of the world and society in general. Todd Berger wrote, directed and also acted in a scene, for a couple of minutes. The story tells the adventures of four couples that join for a Sunday’s brunch when a radioactivity alert is emitted by the authorities. Stuck inside the house, they will use their remaining time to show more about their personalities, unveil some secrets and prepare for the end. Despite of the TV-series style adopted, the plot has its good surprises and shows some keen humor. Actually, there’s an awkward stupidity that works fine here. All characters show distinct behaviors that maintained me curious till the end. The characters' moods ranged from: frightened, in shock, paranoid, sad, frustrated, open-minded, indifferent, neurotic, frivolous or plainly crazy. “It’s A Disaster” didn't spark a lot of laughs but let out some amusing energy with its screwball tone and laudable finale.